The mindset of successful people is different from most people. If you’ve chased after success and have come up short, I have great news for you. Social programming, popular media, and the experts are wrong. Hard work, passion, and hustle are not enough if you’re following the wrong advice. Speaking of success myths, read all about them and how to destroy them in this article. The great news is that success leaves clues. In fact, success leaves lots of clues. Richard Branson. Oprah Winfrey. Bill Gates. Warren Buffett. But here’s the thing. Branson, Winfrey, Gates, and Buffett weren’t born as successful billionaires. Every billionaire and millionaire learned how to master the mindset of successful people. I was that kid who started his business with no experience, money, or team. You better believe I did. Too many to count. Should I have quit before I started? But the game changer for me was mastering the mindset of successful people. Once I knew the game and the rules, I transformed my failing company into a profitable eight figure one. And my company later morphed into a half unicorn. Master the mindset of successful people and you master your destiny. So my dear reader, are you ready to conquer and master the mindset of successful people? Show me your friends, and I’ll tell you your future. The mindset of successful people is to surround themselves with quality people. What’s the ideal version of you? List the five people you spend the most time with. List the top three to five qualities of these five people. Do the qualities of the five people you spend the most time with match your ideal version of you? Write out a list of people who represent the qualities you desire. Include both people you know and people you’d like to meet. Change your mindset, and you change your future. The mindset of successful people is to surround themselves with people who are where you’d like to be. And while you’re at it, find people who are better and smarter than you in key areas. Whatever your standards are is who you become. And your standards are set by those around you. If you’re wise in your choice of people, you’ll find that your standards improve, and so do you. Melia Robinson writes a great article on Tim Ferriss and his thoughts on this topic. Check out the article here. Follow the mindset of successful people and be smart about who you choose to spend your time with. The mindset of successful people ensures they are always learning. Always. You and you alone are your doorway to success. Success starts from within and manifests itself outward. Warren Buffett, Bill Gates, Elon Musk, Oprah Winfrey, and Mark Zuckerberg use the 5-hour rule. Every week you spend at least five hours learning something new. Turn off the TV and read, reflect, and meditate. While you’re at it, eat healthier, exercise, and take care of yourself. The mindset of successful people is to always be learning. Take note and do the same. Read more about the 5-hour rule here and here. When I launched my first company, I had no experience, money, or team. Failure was an everyday thing. So how did I transform my failing company into an eight figure one that later became a half unicorn? First, I was always learning. I read everything I could on success. When I was done reading, I spoke to anyone and everyone who accomplished great things. I reflected. And I thought. A lot. Second, I realized success starts from the inside and later manifests itself outward. My inner thoughts later became my outer world. You change the world when you change yourself. Adopt the mindset of successful people by knowing success starts from within. The mindset of successful people includes a ‘North Star’ to guide your every action. Your North Star is your vision of where you want to be and what you want to be doing. Success Whisperer Napoleon Hill called this principle a Definiteness of Purpose. Read about it here and here. Desire, hustle, and passion mean nothing if you don’t have your North Star to lead the way to your success. The mindset of successful people is knowing both what to do and what not to do. Most entrepreneurs fail because they say ‘yes’ too often and to the wrong things. Read all about the power of saying ‘no’ here. So how do you know when you should say ‘yes’ or ‘no’? Enter the Eisenhower Matrix created by the US President himself. Eisenhower created the matrix to help him separate the important from the urgent. “Does saying ‘yes’ or ‘no’ move me further away or closer to my North Star? 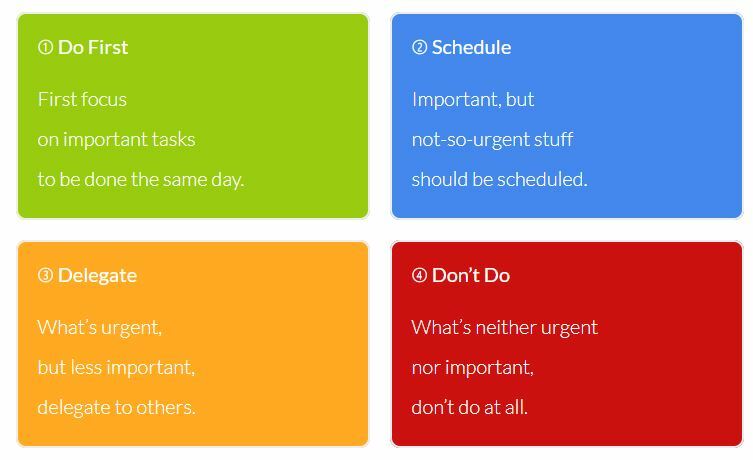 If your answer is ‘yes,’ use the Eisenhower Matrix to succeed and prosper. The mindset of successful people includes having a North Star to guide you to your success. The mindset of successful people includes dreaming big dreams. When you think big, you’ll dream big. And when you dream big, you’ll achieve big. When you think big, you challenge so called conventional wisdom. Dreaming big is the fuel that has you push past your comfort zone. And when you’re outside your comfort zone you unleash your creativity and innovation. I launched my EdTech company out of my parent’s attic. Although I started small, I thought big. In my mind, I was already changing lives for the better and impacting the social fabric of society. Every failure, rejection, and setback I received pushed me to work harder to realize my dream. Dreaming big had me ask ‘why not’ instead of accepting the status quo. And here’s the thing. Dreaming big is contagious. When you dream big, you inspire those around you. I started my journey with a small startup and big dreams. Over time I created a large company and even bigger dreams. Lives changed for the better. Painful problems solved. Smiles all around. Being an entrepreneur is an excuse to solve problems, and change the social fabric of society. And it all starts with dreaming big. Develop within you the mindset of successful people and dream big dreams. Mindset of Successful People Tip 5: Work Hard. Be obsessed with hard work. Put in the time. Make the sacrifice. The mindset of successful people both embraces hard work and welcomes it. What do Jeff Bezos, Mark Cuban, and Elon Musk have in common? Let’s agree that Bezos, Cuban, and Musk are insanely successful entrepreneurs and billionaires. But this is the result from the one thing these three entrepreneurs have in common. As you can read in this article, the one common trait amongst these three billionaires is hard work. Lots of hard work. We’re talking early morning, late nights and weekends. Let me be clear. Working for the sake of working is wrong. All wrong. Working hard means you’re executing on your goals and North Star. The more you work, the more you perfect your vision. And yes, the more you work, the more failures and mistakes you make. But it’s from those so called failures and mistakes that you learn your biggest lessons. In building your empire your new best friends are hard work, execution, and failure. That old saying is true. What doesn’t kill you makes you stronger. When I first started my company, my competition laughed at me. Remember, I was the kid with no money, experience, or team. My competition’s laughter turned to tears when I beat them. Often. The ‘secret’ to my success was out working my competition. What I lacked in talent I made up for in hard work and execution. What I lacked in money I made up for in resourcefulness and passion. I was hungry. Hungry to win. Hungry to work. The only constant was change itself. The more I failed, the more I changed. And it was from changing, adapting, and learning that I perfected my offering. The harder I worked, the more confident I became. And the more confident I became the bigger my dreams. The bigger my dreams, the more I achieved. But don’t fool yourself for a moment. I paid a heavy price. Time was not my own. I had no social life. I lost friends. Everything in life has a price, including success. You decide what you’re willing to pay and in what area. And trust me, you’ll pay. Whatever you decide, know this. The mindset of successful people welcomes both hard work and daily execution. When it comes to the mindset of successful people, follow their lead and let passion be your fuel for success. Passion is what fires you up and gets you going. Read more about this here. 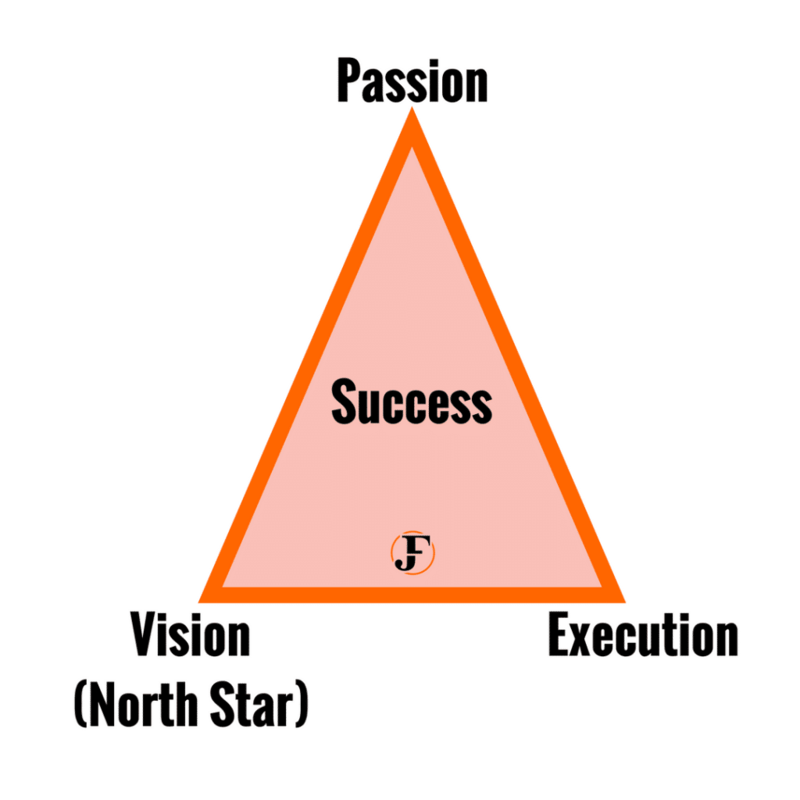 The magic of success happens when you combine passion with vision and execution, as shown below is the Success Triangle™. While passion on its own isn’t enough for success, without passion you’re doomed to fail. I went from the kid who started an EdTech company with no money, experience, or team. Despite the odds my company not only succeeded, but it also morphed into a half unicorn. After the same of my company, I let ego, greed, and arrogance take over. With the same business partner, I launched a company in healthcare. This time the experience, money, and team existed. The company became a seven figure company. Seven figures of losses. Greed and arrogance replaced my passion. And what resulted was me being lazy. I had no passion to figure out the challenges and do whatever it takes to get the job done. Passion leads to resilience and the ability to transform failure into success. Read about these two concepts here and here. Steve Jobs agrees. 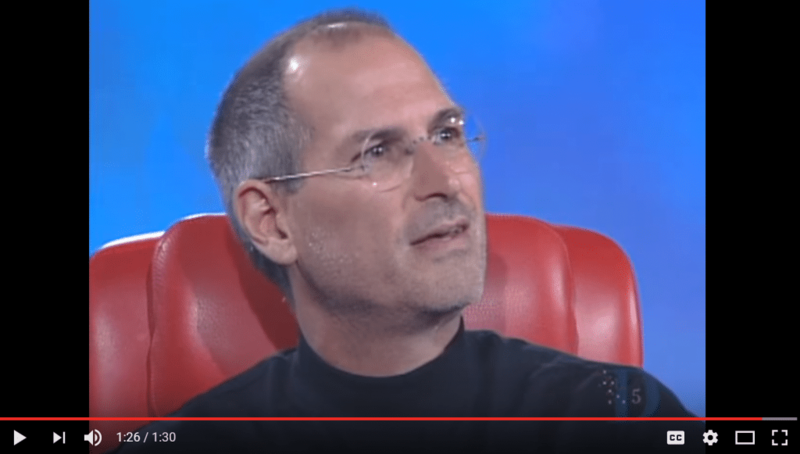 Click here or the picture below to hear Jobs talk about the power of passion. The mindset of successful people includes passion as the fuel for success. Combine passion with a strong vision and execution in solving massive problems. Smart entrepreneur run their companies like cockroach startups. Bootstrapping is a must. And this is where passion opens the gateway to success. Read more about cockroach startups here and bootstrapping here. Do this and success is yours for the taking. The mindset of successful people has no room for an ego. Successful people check their ego and do whatever it takes to not be the smartest person in the room. Do this, and you reap the rewards of a powerful mastermind group. Read about mastermind groups here. And know that titans of business like Henry Ford to Google apply this principle. Effective leaders embrace the idea of focusing on personality strengths and ignoring weaknesses. Would you like to unlock massive success? Focus on your strengths and find other people whose strengths are your weakness. Read my article that talks more about the power of this principle. Remember me? I was that inexperienced kid with a heart full of passion but no money or experience. By default, I wasn’t the smartest person in the room. It was both humbling and enabling. Smart people challenged my ideas and revolutionized my thinking. Did I let others make my decision? I listened, evaluated, compared, and came to my conclusions. What resulted was my company growing into a profitable eight figure enterprise. The mindset of successful people is all about ensuring your not the smartest person in the room. Ever. When you adopt the mindset of successful people, you stand on the shoulders of giants and blaze your trail. In this article, I’ve revealed seven powerful principles that have stood the test of time. And it’s these seven principles that are the mindset of successful people. So where do you go from here, you ask, to jump start your success? Change your mindset, and you change your destiny. Start with one principle. Ask yourself if your mindset matches the mindset of successful people. If you answered ‘no,’ don’t worry about it. This is great news. You now know what you need to do. Read. Think. Journal. Talk to yourself. Do whatever it takes to swap out your mindset with the mindset of successful people. When you complete this activity, move on to the next success principle. I promise you it won’t be easy. But when you adopt the mindset of successful people, you’ll become a different person. Remember, I was that kid who started his company with no money, experience or team. I changed my mindset to mirror the mindset of successful people. And once I did, I unlocked the success that was ready and waiting for me because I was now prepared and ready. My dear reader, if I can do it, so can you. I believe in you. I know that you already have everything that you need to be successful. Right now. Today.